Call, Email, Tweet – say hello today! 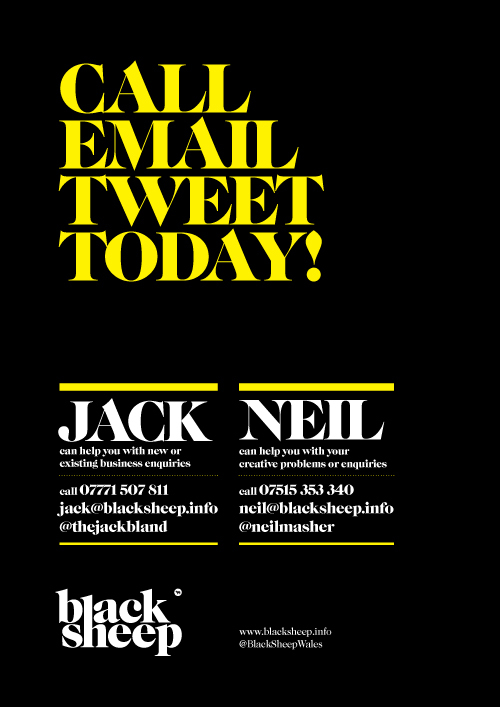 | black sheep was a Cardiff based creative agency, specialising in advertising & design for the printed world. Nothing wooly about that! This entry was posted in Advertising Projects by Black Sheep, Design by Black Sheep, Graphic Design by Black Sheep, Latest News, Misc, Our Work, The brands we've built and tagged 103 Bute Street, Advertising, Advertising Projects by Black Sheep, Black Sheep, Branding, Brochures, Cardiff, Concepts, Creative, Direct-Mail Projects by Black Sheep, Education Projects by Black Sheep, exhibition, free pitching, Graphic Design, Hiking, leisure, logo's, outdoor, Sing for Life, Tenovus, The brands we've built, The Pen, twitter, Wales, Welsh Athletics. Bookmark the permalink.